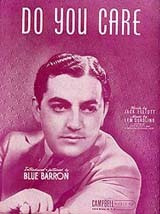 Big Band Library: Blue Barron: "The Music Business of Yesterday and Today"
"The Music Business of Yesterday and Today"
management skills in another line of work, and seemed not to mind being out of the public eye. "I don't think he cares," Russ Carlyle, the featured vocalist with Barron's orchestra from 1936 to 1941, told me. "He made his money. He quit the band when the bands started going the other way - you know, they weren't doing as well. He quit and he went to work for his sister's husband, who owned hotels and oil fields." For many years, Barron, who turned 91 last November, has lived quietly in Baltimore, MD (and often commuted back and forth between there and Cleveland). "He knew nothing about music at all," Carlyle claimed. "He was a businessman. His original idea was to manage a couple of bands - he wanted to become a manager." Actually, while attending college as an undergraduate, Barron had played violin in a campus band and met Sammy Kaye, who was also a student there. "They were going to college together, and Blue wanted to manage Sammy. Sammy had a college band," Carlyle recalled. "Sammy decided to make that a career for himself and Blue came up and put him in a place called The Cabin Club, in Cleveland, Ohio. When they wanted to hold him over, Sammy didn't like the deal, having Blue handle it, because he would be getting some money for it." So they went their separate ways. 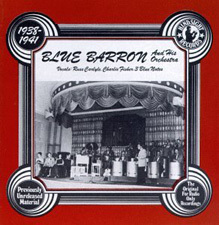 In 1936, Barron had formed what was called "The Blue Barron Orchestra directed by Red Atkins." When Atkins, who had been his college roommate, left, Barron took over full leadership himself, patterning it after some others who were already popular. "In those days, if a band didn't sound like a big name, they hardly got any work at all," Carlyle explained. "That was the way an unknown person could get known . . . to copy another band. 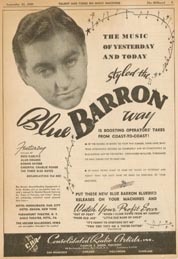 Blue Barron decided he would copy Kay Kyser and Guy Lombardo, and use the singing song titles." By combining elements which others originated, Barron fused together his own style. "Of course, it worked," Carlyle observed. "Then he needed a singer that sounded like Bing Crosby, and he hired me." 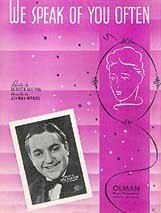 "Barron, Blue" in Who Is Who in Music (Chicago: Who Is Who in Music, Ltd., 1951). Biographies A Through K (New Rochelle, NY: Arlington House Publishers, 1974), pp.551-552. McCuen, Brad. 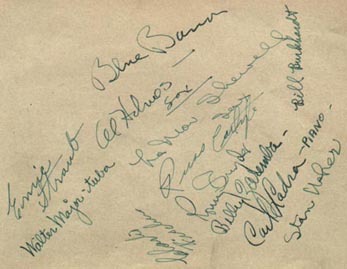 Liner notes, "The Uncollected Blue Barron and His Orchestra 1938-1941,"
Popa, Christopher. Interview with Russ Carlyle, Aug. 12, 2004. (New Rochelle, NY: Arlington House Publishers, 1975), pp.126-128.
" . . . Barron, a short pudgy, effervescent man, had what some of the other mickey-mouse leaders didn't have: a sense of humor about himself and his music. He didn't take either too seriously, nor did he try doggedly to defend his music; in fact, if there weren't any fans within hearing distance, he'd kid about the sounds he was making . . . "
As for Barron himself, he continued to lead bands at sporadic engagements into the 1960s, then exited the music business. "I tried to call him about five, six, seven years ago, but never got an answer," Carlyle admitted. Still, Carlyle, now age 83, looks back on his time as a member of Barron's orchestra with pleasure. "The people enjoyed the band, they enjoyed me. We were on the air every night, we made records, we made a couple movies, so . . . we had the recognition we wanted," he reminisced. "You gotta understand, that was an era that only lasted seven years, because after the war, it was all over . . . Rock and roll, money and greed... a different era... a different generation . . . The era is over for me. Nobody wants to talk to an old guy. And these young people, in the corporate world, don't even have the courtesy to call you or talk to you. It's a different world." No wonder Blue Barron dropped out of sight. 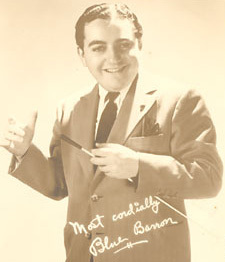 In 1937, the orchestra made its network radio debut from the Southern Tavern in Cleveland, and that exposure helped to publicize Barron's name. "We were lucky enough to be heard in New York one night, from Cleveland, Ohio, when they were having a strike," Carlyle recalled. "We came to New York, and a woman by the name of Maria Kramer, who owned the Edison Hotel and the Lincoln Hotel, heard us and hired us." 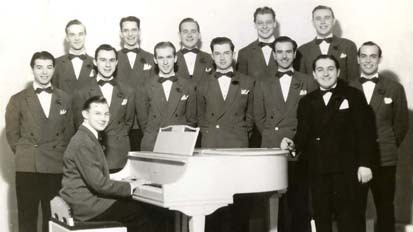 The band opened in the Green Room of the Edison on January 5, 1938. "She kept us there for nine months, which was, really, uncalled for," he noted. "And we were on the air almost every night, coast-to-coast. Of course, once you got on the air, everything else was automatic - you made movies and you had a record contract." Sure enough, in just under a month, things fell into place. 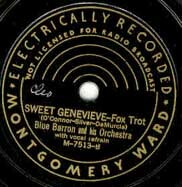 They began using the tagline, "The Music of Yesterday and Today," and were signed to Bluebird Records, and continued to be heard from the Edison. "In those days, the hotel would pickup the time, so if the band had the network -- a 'wire,' as we call it -- it cost, maybe, $100 at 10 o'clock or 10:30 or 11 o'clock to broadcast coast-to-coast, and that was advertising," he explained. "But after the war [World War II], you couldn't buy one minute for a hundred bucks! And that's how the big bands were made - they were made because the radio station needed [to fill] airtime, and the bands filled that void." Barron was heard not only on NBC's Red and Blue radio networks, but also on the CBS and Mutual systems. "We were lucky to get into the Edison Hotel and we were lucky to get the airtime we had," he reminisced. "I guess she must have owned some of the band, in order to do that," he said. "You know, nobody does anything for nothing, and that was the way it was with most of the bands. Most of the big players that were on the air, coast-to-coast, were like a 50/50 split - the manager owned half the band." Kyser and Lombardo (and Sammy Kaye, for that matter) may not have appreciated their new competition, especially someone who admitted to copying them. "Oh no, that was something that they did, anyway," Carlyle stated. "Nobody could say that you couldn't copy somebody. There were a lot of bands that sounded alike, you know. They had no restrictions on that at all." So how could a person distinguish one of those bands from the other? "First of all, you could tell it by who's singing," he answered. "Introducing me, on every record and every song that I sang, he says, 'Here's the romantic style of Russ Carlyle.' Then, our singing song titles were a little different from Kay Kyser's and Sammy Kaye's. Sammy Kaye just introduced the titles; we introduced the song by singing an old song that had something to do with the number we were going to play, and used the slogan called 'The Music of Yesterday and Today.'" "We made a lot of recordings," Carlyle remembered. His first vocals committed to disc were Did An Angel Kiss You?, Who Are We to Say?, Shadows On the Moon, and At a Perfume Counter, the latter the most-played of the four. "That got quite a bit of action," he boasted. "Well, the ones I liked you probably don't even remember: Darn That Dream was one, I Hadn't Anyone 'Til You, there were quite a few of them... The Singing Hills... they were songs that were being played in that era - you know, that time. And some of them were big hits and some of them were duds, like anything else was." 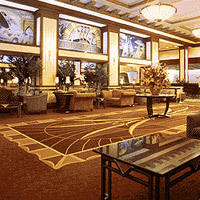 Besides making recordings in New York City and Chicago, the band typically played hotel engagements, such as the Astor or Biltmore in New York, for about 26 weeks total. During the other 26 weeks in the year, they played theaters, such as the Oriental in Chicago, and one-night stands across the nation. "We were all over the country," he reported. While other bands worked their way to the top, Barron's very first theatre appearance was, impressively, at the Paramount Theatre in New York City. The 1930s and '40s are often now referred to as "The Swing Era," but, nonetheless, there existed a huge audience for sweet bands, too. "Well, there was Blue Barron, there was Sammy Kaye, there was Guy Lombardo, there was Orrin Tucker... there was a lot of bands that were sweet," Carlyle recalled. Critics such as George T. Simon lumped such outfits together in the derogatory category of "mickey mouse" bands. "Didn't bother me anyway - I was the singer," Carlyle told me. rat-a-tat and slur into harsh, irritating mutes, a trombone that glisses all over creation, all sorts of overslurring, an electric guitar, a rhythm section that puts most of its emphasis upon a tuba burping on the first and third beat, singing of song titles, attempted glee club effects, and all similar, musical tricks that associate corn with commercialism and commercialism with corn . . . "
He became one of the band's stars. "Well, I think I helped him a great deal - I was the 4th top vocalist in the country, in 1939, in the Billboard magazine," Carlyle commented. Although Barron was the leader, he never gave him much direction on how to sing. "He didn't do that at all," Carlyle said. "The only thing that hurt me, as a vocalist, was that I had to sing the way that band played. I was offered a job with Tommy Dorsey while I was with Blue, and I turned it down, because I was afraid to take the chance. That would have been a very good deal for me, if that would have worked out, but I didn't take the job and they hired [Frank] Sinatra. We all sounded the same in those days, all the singers were singing [like] Bing Crosby. That's how we were able to work." "He was lucky enough to surround himself with some good talent," Carlyle observed. "I was a good singer to begin with, and the band was a good band, and there were some arrangers in there that were pretty good." Each contributing to the band's popularity, among the sidemen were Bill Burkhardt and Ernie Straub (trumpets), Stan Usher and Charlie Fischer (trombones), Al Holmes and LaMar Shewell (saxophones), Carl Ladra (piano), Ronny Snyder (guitar), and Billy Zaremba (drums). "We were all kids in those days," Carlyle pointed out. I asked Carlyle to further recollect the use of Barron's tagline, "The Music of Yesterday and Today." "Very, very big," he stressed. "Because it told what we did. 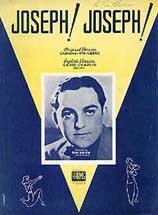 'Music of Yesterday and Today' only referred to the singing song titles. In other words... At a Perfume Counter, the band would play . . . about four or five or eight bars, and I would come in and sing a song. Now for At a Perfume Counter, [I sang] (I Found a) Million Dollar Baby - that's an old song, that song was popular in the '20s. But At a Perfume Counter was 1938. The 'Music of Yesterday' referred to the five and ten-cent store [one of the lines in Million Dollar Baby]." Carlyle left Barron in 1941. "Frankly speaking, to be honest about it . . . Maria Kramer . . . did not want me on the band," he revealed. "She figured they could save money, the band was enough that they didn't need me. That was the biggest mistake they ever made, because when I went out on the road with Blue that summer on the stage shows, I tore the house apart! And he tried to get me back with Maria Kramer. Blue didn't want me to leave." It became a blessing in disguise: the chance for Carlyle to form his own orchestra. "What I originally did, I copied another band, in those days," he recalled. "I didn't use it long, until after I went in the Army. I copied a band by the name of Hal Kemp. He was killed in an accident, and there wasn't anybody that sounded like him, and he was becoming a very big band. I got a hold of an arranger who knew the style very well, and so I used the style of Hal Kemp. Then after the war, I augmented the band into five saxes... a big band... and went into the Blackhawk Restaurant [in Chicago] and I used a combination, then, of Glenn Miller and Hal Kemp." That was 1947, and during the next decade, Carlyle's band, using its own slogan, "The Romantic Style of Russ Carlyle," became identified with danceable tunes like In a Little Spanish Town and Polka Dots and Moonbeams, and made three albums for ABC-Paramount. He also was active composing tunes. "I wrote a song called If I Ever Love Again - Sinatra recorded that," he said. But gradually, demand for his big band diminished. "It was fine for a while, but then it started to go down, so I went from fifteen men to twelve men. And then I got to the point where I had to use ten men, because the band business was going out," he recalled. "The generation changed, and they went into guitars and they went into rock and roll, and blues, and that kind of stuff. And the band business went out of business. And the ballrooms closed. And the theaters never used bands on the stage anymore." Popular music shifted more toward singers. "I had several singers with me that didn't last too long, they were [with him] three years, two years. Of course, you know, it was hard for girls; some of them would marry the guys in my band, or give me trouble. Women were a problem on a band with a bunch of guys," he remarked. Carlyle experienced this 'trouble' first-hand, after singer Patty Zych became part of his group in 1960 (he changed her name to Patty Clayton). "Patty joined the band and she was with me for about ten years, then we got married!" he said. Together, they entertained at some of the best hotels in the country, such as the Peabody in Memphis, the Cavalier in Virginia Beach, and the Dunes in Las Vegas, until finally retiring in the late 1980s.